Pine-Sol Scented All-Purpose Cleaner, cuts through grease and grime fast. Pine-Sol Scented All Purpose Cleaners deodorize and eliminate unpleasant odors. Preferred over leading competitors, the powerful scent of clean lingers long after the job is done, assuring customers, guests and staff that it’s clean. Removes and cleans dirt, grease, scuff-marks, food and beverage stains and mud stains without leaving a sticky residue. Ideal for more than just floors, use kitchens, cafeterias, bathrooms, any tough cleaning job. For general cleaning use 1/4 cup per gallon of water. No rinsing required, except on rubber or asphalt tile. 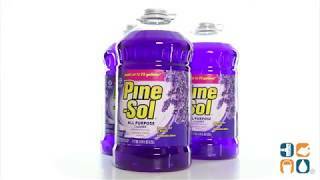 Pine-Sol Scented All-Purpose Cleaner, Lavender Clean, 144-oz Bottle, 3 Bottles per Carton.